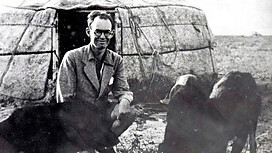 The great Welsh journalist Gareth Jones was murdered one day short of his 30th birthday in China on August 12th, 1935. My monograph – click here – briefly outlines his life and describes a flight he took with the electioneering Hitler in 1933. It’s free to download on multiple platforms. The following words appeared in what deserves to be counted as one of the great “I was there” articles in journalism. Welsh journalist Gareth Jones wrote this on February 23rd 1933. from his seat in the Richthofen, Hitler’s plane. He and a Fleet Street colleague were the first journalists to accompany the Führer in his new aeroplane, during his election campaign to win total power through the democratic process. It is pure scoop, rather prosaically defined as “a piece of news published by a newspaper in advance of its rivals.” By some margin, in the case of this precocious and fearless writer who was murdered in China 81 years ago today, on August 12th, 1935, one day short of his 30th birthday. The world was able to read one of the earliest eyewitness accounts of a monster of depravity, whom Jones describes as “like a middle-class grocer”, setting off to work. During the flight Jones jotted in his notebook: “If this plane were to crash, the history of the world would be different.” It became the opening line in his account of this flight, which appeared a few days later in the Western Mail. He described Hitler’s arrival for the flight, on a snowy runway at Tempelhof Airport in Berlin. “Somebody gave a cry: ‘The Leader is coming.’ A car drives through the snow. Out steps a very ordinary looking man…a slight figure in a shapeless black hat, wearing an ordinary greyish brown mackintosh. He looks like a middle-class grocer. His hair is fairly dark and brushed. Hitler surprised me by his smile. He was more natural and less of a poseur than I had expected. So who was the remarkable and still under-sung Gareth Jones? His brief career, in which he filed more international scoops than most of his contemporaries would deliver in a lifetime, followed a path closer to Indiana Jones, with an additional touch of Zelig, a fictional character who had the knack of turning up in important places – until he found himself in the wrong, last place. Jones’s ultimate misfortune may have been to stray too deeply into the murky world of international power politics. He lost his life in 1935, on his last big assignment, to try to make sense of the murky political picture in the Far East, dominated by the tension between between China and Japan, with Russia pulling the strings in the background. The world, sliding towards another great conflict, had no time to spare for solitary victims such as him, the small, brave people on the edge of the action. This is an extract from my e-book, So wise, so young – Gareth Jones, Journalist. (Free to download, from Smshwords). February 23rd, 1933, on a snowy runway at Tempelhof Airport in Berlin. A young Welsh reporter is in place for the first of a series of remarkable scoops. His articles will be read around the world and will illuminate the last two years of his short life, before he becomes, according to some, the first casualty of the coming Second World War. The man, the trim, sharply intelligent and journalistically mature beyond his years Gareth Jones, stands alongside the Richthofen, the fastest passenger aeroplane in Germany, capable of the then astonishing speed of 150 miles an hour. He is waiting for Adolf Hitler to arrive. The leader is just three weeks into his destiny job as Chancellor of Germany. He is about to make a quick dash to Frankfurt, part of a whirlwind electioneering programme that will hurtle him like a human shuttlecock around Germany in his bid to win total power through the democratic process. Among the assembled Nazi party aides awaiting his arrival is Hitler’s image maker, the indifferent novelist with a Ph.D. in 18th-century romantic drama, Joseph Goebbels. Jones is one of only two outsiders, non-German observers present that day. The other is Sefton Delmer of the Daily Express. Together they are the first journalists to accompany Hitler in his new aeroplane since he became Chancellor. Airborne, Jones jotted in his notebook the following momentous line: “If this plane were to crash, the history of the world would be different.” It became the opening line in his account of this flight, which appeared a few days later in the Western Mail. It deserves to be counted as one of the great “I was there” articles in journalism. Gareth Jones was already a well-established investigative journalist. He was generally pictured in an ample overcoat and a trilby, a mild-mannered man behind thick round Harry Potter-esque glasses. To describe him as a temperate version of Indiana Jones is not so wide of the mark. This Jones, too, was on an urgent quest – for information. He had the style, if not the look, of the adventurer. When he made his final journey into the Gobi desert, he was following roughly in the footsteps of the James Bond author Ian Fleming. Jones had worked as a personal secretary to David Lloyd George before taking up work as a freelance journalist. He may not have shared the facility with words of his more famous, and similarly short-lived countryman Dylan Thomas, who was recognized in his own lifetime as one of the greatest poets in the English language. Reportage was not then, quite so much as it today, about eloquent, elegant picture painting. Yet just as Dylan Thomas worked, with relentless application at every word, so did Jones diligently set up interview after interview to prise out that essential kernel of truth. In the days before strictly ordered press accreditation, and with a lot less competition, Jones managed to meet many important figures of the day. He conformed to the model of the foreign correspondent who travelled fast and light with a battered contacts book, only up to a point. Jones was teetotal, a departure from the common stereotype of the drink-sodden barfly. He sent long, dutiful letters home to his family, full of tender familiarity, and the constant craving for Auntie Betty’s cake.